le chaudron de vulcain – January 22 , 2019 . EN. Peru : Sabancaya , Colombia : Nevado del Ruiz , Indonesia : Agung , Philippines : Bulusan , Vanuatu Archipelago : Ambae . January 22 , 2019 . EN. Peru : Sabancaya , Colombia : Nevado del Ruiz , Indonesia : Agung , Philippines : Bulusan , Vanuatu Archipelago : Ambae . Home / agung / January 22 , 2019 . EN. Peru : Sabancaya , Colombia : Nevado del Ruiz , Indonesia : Agung , Philippines : Bulusan , Vanuatu Archipelago : Ambae . January 22 , 2019 . The gas columns and eruptive ash reached a maximum height of 1,500 m above the crater, with limited visibility. The dispersion of these materials occurred within a radius of about 30 km, mainly to the South and Southwest sectors. The MIROVA satellite system recorded 1 thermal anomaly with a value of 10 MW VRP (Radiated Volcano Energy). In general, eruptive activity maintains moderate levels. No significant changes are expected in the coming days. Source et Photo : IGP. Manizales, January 20, 2019 (12:30 pm local time). 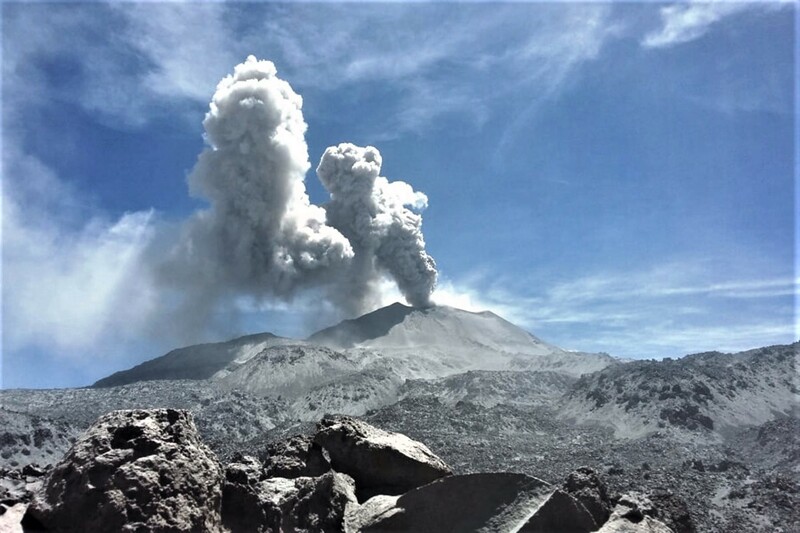 Subject: Bulletin of extraordinary activity of the Nevado del Ruiz volcano. Increased seismic activity. The level of yellow activity is maintained at level (III): changes in the behavior of volcanic activity. During the last hours of today’s day, January 20, 2019, and until the release of this bulletin, volcano-tectonic seismic activity, associated with rock fracturing, has increased dramatically in the West-South-West sector of the volcanic building, at an average distance of 4.9 km, compared to the Arenas crater. The recording of a volcano-tectonic earthquake occurred at 09:02 (local time), a magnitude of 2.4 ML (local magnitude), located 4.6 km west of the crater Arenas, at a distance of depth of 5.4 km. The volcano continues to emit water vapor and gases into the atmosphere, among which is the sulfur dioxide (SO2), as evidenced by the values ​​obtained by the SCANDOAS stations installed in the region of the volcano. Volcanic deformation measured from electronic inclinometers showed slight changes over the last few days, which correspond to those recorded in the other monitoring parameters. The Nevado del Ruiz volcano continues at the level of yellow activity. 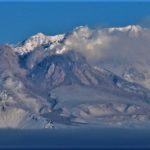 It is not excluded that an activity may indicate an acceleration of the process, resulting in greater instability of the volcano and, consequently, a change in its level of activity. Although the instability of the volcano has lasted for eight years, it is essential not to get used to its behavior and to be attentive to the official information that will be published by the Colombian geological service. It is repeated to the authorities of the Caldas and Tolima Departments to maximize actions focused on both risk reduction processes and disaster management as measures to prepare for the future activities of the Nevado del Ruiz volcano. It is recommended that the community remain alert to any changes in the activity of the volcano. The COLOMBIAN GEOLOGICAL SERVICE is attentive to the evolution of the volcanic phenomenon and will continue to inform in a timely manner of any changes that may occur. In addition, it recommends that only official information be taken into account and that it visit its website www.sgc.gov.co, where it will continue to publish additional information to this newsletter and of general interest. Issued: January 21 , 2019.
level of activity at Level III (SIAGA). 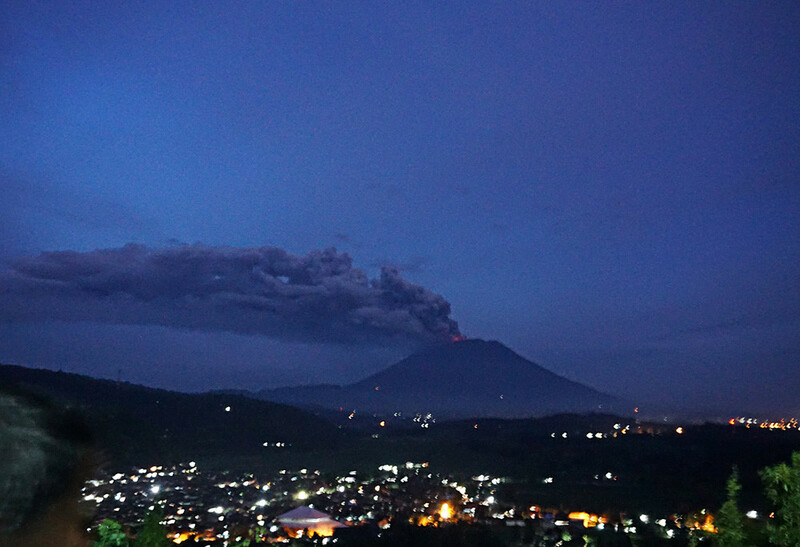 G. Agung (3142 m altitude) has been in crisis since 21 November 2017. 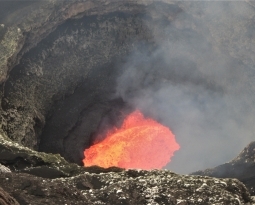 The last eruption occurred on 22 January 2019. Since yesterday and until this morning, the volcano was clearly visible until it was covered with fog, the winds were strong and oriented to the East and Southeast. 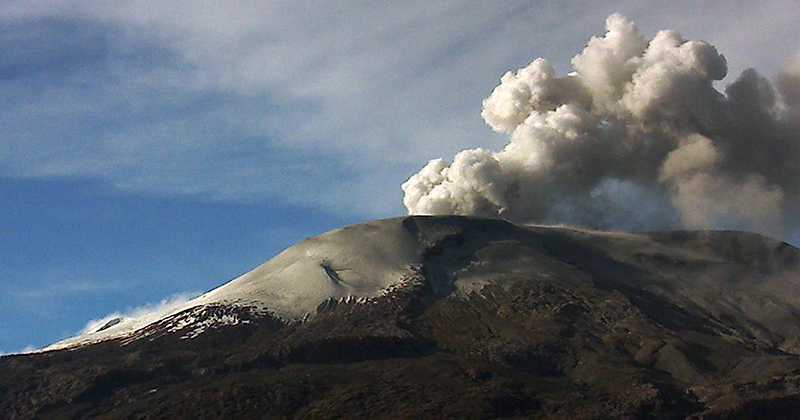 It was observed that the smoke from the crater was white, of low intensity and was about 400 meters above the summit. The communities around G. Agung and mountaineers / visitors / tourists should not climb, have activities in the area of ​​estimated risk, which is within a radius of 4 km around the crater G. Agung. The estimated danger zone is dynamic and continues to be evaluated. It can be modified at any time to follow the most recent observation data. 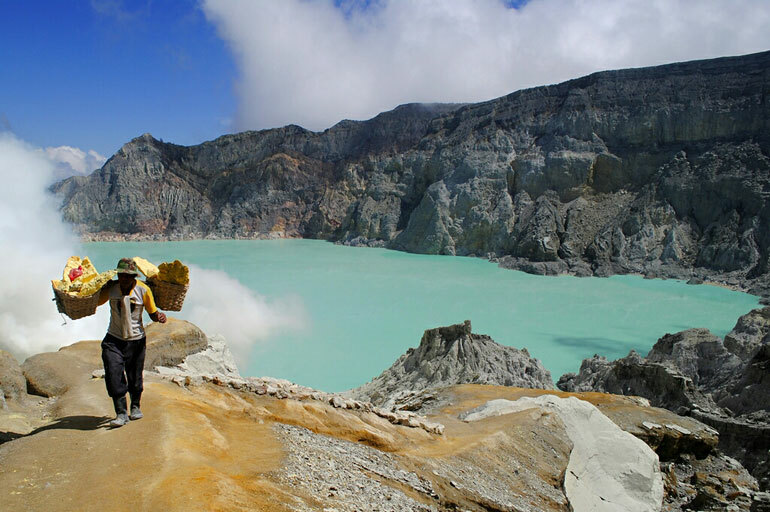 Communities living and traveling around streams from Gunung Agung are sensitized to the potential secondary hazard in the form of lahar descents that can occur especially during the rainy season and if the eruption material is still exposed in the rainy season. the summit area. Level III (SIAGA) status applies only within a 4 km radius, as indicated above. Outside the activity area, the activity can run normally while remaining safe, but must remain vigilant. Source : Magma Indonesia , PVMBG. Photos : Thomas Olsen , The Jakarta Post . On its 24-Hour Regional Weather Forecast issued at 5:00 AM today (January 21, 2019), the Philippine Atmospheric Geophysical and Astronomical Services Administration (PAGASA) forecasted that the Bicol Region will be experiencing cloudy skies with scattered rainshowers and thunderstorms caused by Tropical Depression Amang. Specifically, Sorsogon province might be impacted by possible flash flooding and landslides due to scattered moderate to heavy rains. In view of the above, PHIVOLCS strongly recommends vigilance and readiness of communities in pre-determined zones of lahar hazards in Bulusan Volcano. Prolonged and heavy rainfall may cause excessive erosion of existing pyroclastic deposits in the upper slopes of Bulusan Volcano, which can trigger lahars in rivers draining the southeastern, southwestern and northwestern flanks. Potential lahars can threaten downstream communities along the Malunoy (Patag), Mapaso, Cadac-an, Tinampo and Cogon Rivers in Irosin and the Añog-Rangas River in Juban. 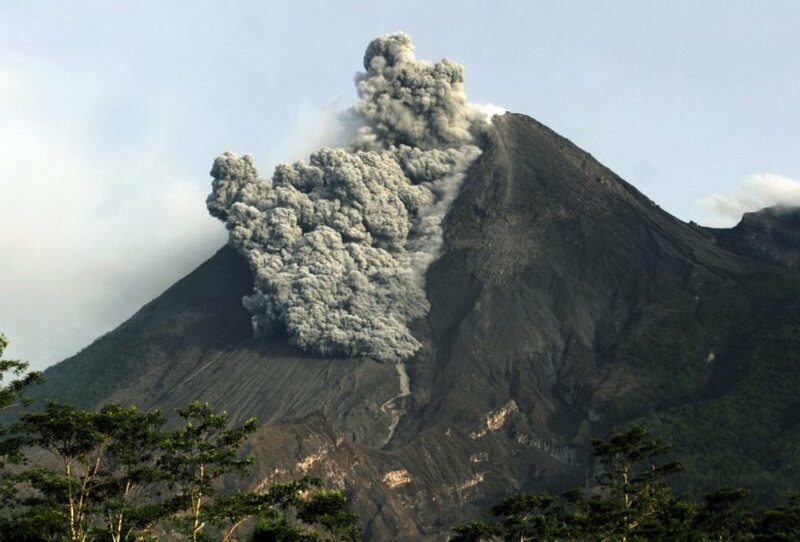 PHIVOLCS reiterates that entry into the four kilometer-radius Permanent Danger Zone should be avoided due to the possibility of sudden and hazardous steam-driven or phreatic eruption, rockfall, landslide, and lahars. 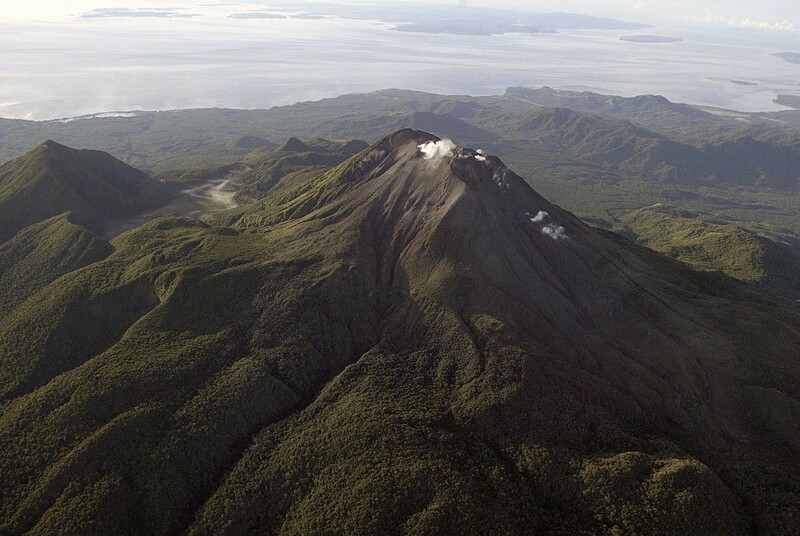 PHIVOLCS is closely monitoring Bulusan Volcano’s condition and any new development will be relayed to all concerned. 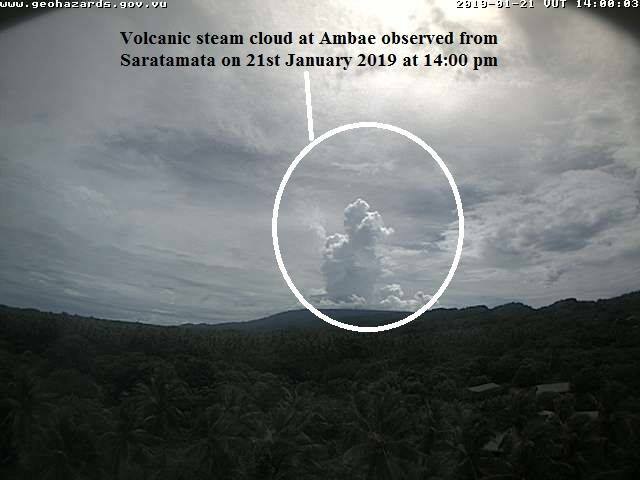 Ongoing seismic activity recorded and volcanic steam cloud observed at Ambae volcano continue to show that the volcano activity is still in the major unrest state .The volcanic Alert Level remains at Level 2 (Major Unrest). 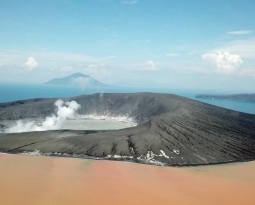 The possibility that the Ambae volcano activity escalate to the level of minor eruption (Level 3) and/or decreasing to lower unrest Level (Level 1) remains low in the coming days . The Danger Zone for life safety remains at 2 km radius from the active vent and creeks or streams could continue to change their behavior when it rains due to the volcanic ashes that fell on Ambae during the 2017 and 2018 eruptions. Landslide may occur at some areas during heavy rain fall. 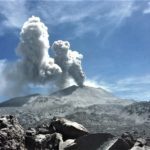 The Vanuatu Meteorology and Geohazards Department continues to closely monitor this volcano activity. More information will be provided as soon as necessary. 22 Janvier 2019 . FR. Perou : Sabancaya , Colombie : Nevado del Ruiz , Indonésie : Agung , Philippines : Bulusan , Archipel du Vanuatu : Ambae . 23 Janvier 2019. FR. Kamchatka : Sheveluch , Colombie : Nevado del Huila , Guadeloupe : La Soufrière , Guatemala : Fuego , Mexique : Colima .